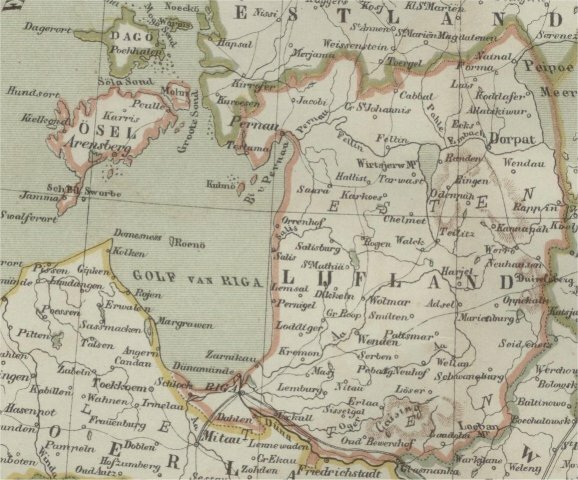 Map of Livonia, detail of a map from ‘Wereld-Atlas voor kantoor en huiskamer / door J. Kuyper. – 1e Deel Europa. – Amsterdam : G.L. Funke, 1880. In Baedeker’s Russia -English edition 1914 p. 55- we read: “Riga (20 ft.), РИГА, Lettish Rihga, the capital of the government of Livonia, is situated in a sandy plain on both sides of the Dvina (p.31), here 1/2 M. wide, aboud 9 M. above its outh in the Gulf of Riga. Riga is, after St. Petersburg, the most important Russian commercial and industrial town on the Baltic Sea, and it is the headquarters of the 20th Army Corps and the residence of the Greek Catholic Archbishop of Riga and Mitau, as well as the seat of the National Consistory of the Lutheran Church.The population is estimated at 530,000.” Here ft. is height in English Feet, M. is English mile. With the introduction of postage stamps -1 January 1858- also the necessity of cancellation comes into existence. 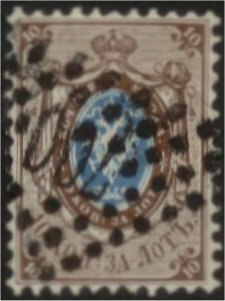 In the beginning postmarks of the former period were still used for the date on the backside of the cover in combination with ‘cancelling’ by a writtencross in black ink. Of course this was not efficient and the cancellation could be removes for re-using the postage stamp until the introduction of number-cancellations. The numbers “1” and “2” in circles of dots were introduced as number-cancellations for St. Petersburg and Moscow in circular no. 138 of 26 february 1858. The other towns had to use the old postmarks until the coming of new cancels. Circular no. 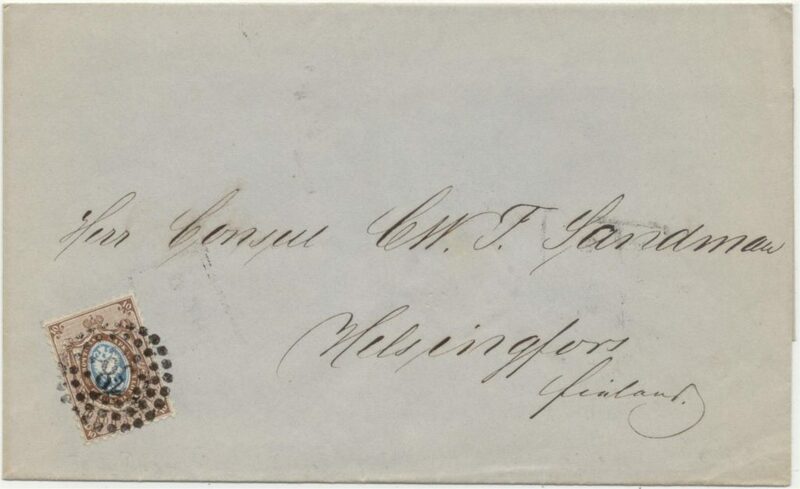 1847 of 31 May 1858 introduced these kind of cancellations for whole Russia. The circular no. 157 of 17 august 1858 gives more details. A number (3 to 60) surrounded by points in the form of three concentric circles belongs to capitals of “guberniya”, governments. Number 38 belongs to Riga as capital of Livonia gub. With the circular no. 53 of 12 April 1860 were introduced the new standard-postmarks in whole Russia. The number-dot cancellations were withdrew by circular 123 of 11 February 1863, with one exception: see the type below of Riga-station. For the district-postoffices, range under the government-offices, a second kind of these number-cancellations was used: a number in an rectangle of points. Also this type is used in Riga. This type with number 388 is used for the postoffice of Boldera, a suburb of Riga. Finally in Riga is used a number in triangular cancellation with truncated corner for the sub-post offices. 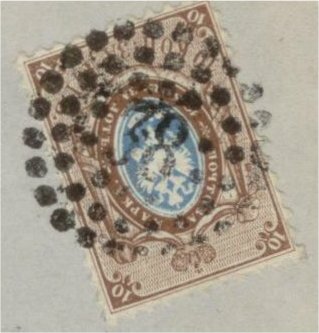 Numeral dotted postmark 700 = Riga station, these type number-dot cancellations were withdrew by a circular of 20 October 1877. This type with number 700 is used for the postoffice in the Riga-Dünaburg railway station.